ARISS International delegates, officers, and team members have convened this week in Tokyo for what is being called "a critical meeting" to discuss strategy, teamwork, hardware, and operations. 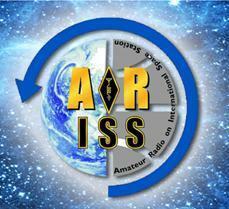 Delegates to the August 20-23 gathering represent the five ARISS member regions -- the US, Russia, Japan, Canada, and Europe. Keigo Komuro, JA1KAB, of ARISS-Japan and the Japan Amateur Radio League (JARL) delivered opening remarks, and ARRL First Vice President Rick Roderick, K5UR, in Tokyo for the JARL Ham Fair, spoke briefly. ARISS-International Chair Frank Bauer, KA3HDO, is heading up the meeting. The Japanese Space Agency JAXA will welcome the group and offer an overview of its Innovative Satellite Technology Demonstration Program. ARISS working group business discussions and reports, including regional reports, ARISS terms of reference updates, space agency coordination status, sustainability and fund raising, and future projects. Technical discussions on current and future hardware developments, including next-generation ARISS radio systems, and an update on the Ham TV system. Operations discussions, including presentations on educational activities, international expansion and planning of SSTV, school selection and regional scheduling procedures, and plans for the ISS mission of UK astronaut Tim Peake, KG5BVI, and the Astro Pi Project during his mission. Astronaut Tim Peake, KG5BVI, will head to the ISS in November. The UK's first European Space Agency astronaut, Peake plans to share his "Principia" mission space adventure with students on Earth via Amateur Radio, and he's invited youngsters in his country to contact him while he's on station. Peake is scheduled to head to the ISS in November for a 6-month duty tour. Are you now active on UHF? How often do you presently operate in the ARRL UHF Contest -- never, occasionally, or always? If you do not presently participate, why not? If you do not presently participate, what changes might compel you to participate in the future? What are your ideas for attracting more amateurs to UHF operation in general? The subcommittee has requested that participants submit their comments by October 1. The members of ARRL's Ad Hoc Subcommittee on VHF and Above Revitalization also expressed their gratitude for the many comments they received during the initial round of VHF+ contest rule changes. A late afternoon fire on August 18 badly damaged the Boulder County, Colorado, home of well-known contester Chuck Cullian, K0RF. George Schultz, W0UA, who has operated frequently from K0RF, explained that the building is roughly divided into a residential side and a garage/ham radio shack side. He said Cullian told him that the fire pretty thoroughly gutted the residence, leaving Cullian and his family temporarily homeless. "I'm still kind of in shock over it myself," Schultz told ARRL. "I've spent more time up there over the past 30 years than anyone, I think, besides his immediate family." Chuck Cullian, K0RF, in his well-equipped radio room in better times. Schultz said on August 19 that he had not yet been to the house and could not speak directly as to the extent of the damage, although according to media accounts, the Boulder County Sheriff's Office has deemed the house a total loss. No one was injured. Schultz said those in the house at the time -- Cullian's wife, his daughter, and her boyfriend -- called 911 and tried in vain to put out the fire as soon as they realized what was happening. Schultz said the fire appears to have started in a laundry room, then moved into the residential wing -- away from the end of the long, angular ranch-style home where a finished radio room occupies two bays of a six-bay garage. "Apparently, the fire smoldered for some time," Schultz told ARRL. "They were in the living room, quite a ways away, and blocked from the laundry room by the kitchen. Suddenly, it just exploded. I'm just thankful they got out of there." Schultz said the theory at this point is that the fire began in a clothes dryer or in related venting. "As of now, we think there was no direct effect from the fire on the 'radio-wing,'" Schultz said. "Under the circumstances, this is of small consolation, of course." He also did not discount the possibility of water or smoke damage to those parts of the structure not directly affected by the flames. Persistent optimism continues to prop up the hopes of several individual radio amateurs and groups to mount a DXpedition to the most-wanted and elusive DXCC entity on the globe -- the Democratic People's Republic of North Korea (P5). To date, no recent efforts have succeeded. The latest to announce that plans for a P5 operation are on the verge of success are Antonio Gonzalez, EA5RM, and Manuel German, EA7AJR, both DXpedition veterans. On their fourth trip to North Korea since 2013, Gonzalez and German met on August 17 with what they described as "high-level officials" in North Korea's telecommunications ministry. In an August 17 news release, Gonzalez and German said that the officials in Pyongyang -- North Korea's capital -- "were very kind, receptive, and cooperative. They knew everything about ham radio, so it was really easy to talk with them about our ham radio operation project." The pair began efforts to secure permission for a North Korea operation more than 2 years ago. "If everything goes as it is going up [until] today, I can tell that we are very close to get[ting] permission," the news release concluded. Unidentified North Korean telecommunications ministry officials flank Manuel German, EA7AJR (second from left), and Tony Gonzales, EA5RM, during a visit to Pyongyang, North Korea. Gonzalez and German are not alone in attempting to be the next to activate North Korea since Ed Giorgadze of the Republic of Georgia operated as P5/4L4FN in 2001 and 2002, making more than 16,000 contacts before being asked abruptly to cease transmitting and pack up his gear. The ARRL subsequently accredited his SSB and RTTY operation for DXCC. Giorgadze, who was working for the UN World Food Program in Pyongyang at the time, had tried for more than 2 years before obtaining oral permission from North Korean authorities to operate. Earlier this year, Polish radio amateur Dom Grzyb, 3Z9DX, announced that he had secured written permission to operate from North Korea in January or February 2016. He is supposed to go to Pyongyang for a final meeting to discuss guidelines for the operation, which would be for 5 days, SSB only, on 20, 15, and 10 meters from a secured location with 24/7 government supervision. 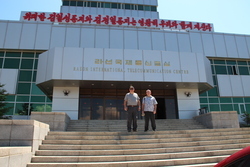 Paul Ewing, N6PSE, and David Flack, AH6HY, of the Intrepid DX Group have visited North Korea several times since announcing intentions in 2013 to operate from P5 for 2 weeks with two groups of 12 operators. In an August 10 blog post that he has since removed from the web "in solidarity with other efforts to activate P5," Ewing seemed pessimistic that anyone would be allowed to operate from the secretive communist enclave anytime soon. For now, though, he's extending "best of luck to all efforts to activate the DPRK." 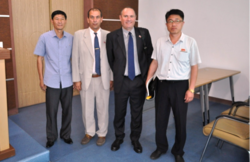 Paul Ewing, N6PSE, and David Flack, AH6HY, during a 2013 visit to North Korea. In addition to the 2001-2002 P5/4L4FN operation, the only other approved operations occurred in 1995, when Martti Laine, OH2BH, and two other Finnish radio amateurs demonstrated ham radio by making 20 contacts as P5/OH2AM. In 1999, Laine operated briefly as P51BH, making just 263 contacts. An incumbent Section Manager has won his bid for a new term of office. Ballots were counted August 18 at ARRL Headquarters in the only contested race in the summer election cycle. In addition, one new Section Manager will come onboard this fall. All new 2-year terms of office begin on October 1. In the Los Angeles Section, incumbent SM David Greenhut, N6HD, was re-elected over challenger Philip A. Minch, K6MUG, of Long Beach, California, 601 to 213. Greenhut, of Woodland Hills, California, has served as the Los Angeles SM since 2009. The Sacramento Valley Section will have a new Section Manager starting this fall. Dr Carol Milazzo, KP4MD, of Citrus Heights, California, was the only nominee for the position. She currently serves as an Assistant Section Manager. Incumbent SM Ron Murdock, W6KJ, of Yuba City, decided not to run for another term of office after serving since July of 2007. These incumbent Section Managers did not face opposition in this election cycle, and they will continue with 2-two year terms of office starting on October 1: Mark Tharp, KB7HDX (Eastern Washington); Monte Simpson, AF7PQ (Western Washington); Bill Hillendahl, KH6GJV (San Francisco); Jack Ciaccia, WM0G (Colorado); Gene Clark, W4AYK (Georgia), and Lee Cooper, W5LHC (South Texas). The American Radio Relay League (ARRL), a non-profit membership organization with the objectives of promoting and advancing the art, science, and enjoyment of Amateur Radio, seeks a full-time Chief Executive Officer in Newington, Connecticut, to direct its day-to-day activities. The League has 167,000 members, an annual budget of $15 million, 100 paid employees, a nationwide network of volunteers, and an elected board of 15 directors. The League publishes a monthly magazine and many books on radio topics, and it oversees training and assistance programs for Amateur Radio activity. It also serves as Amateur Radio's primary interface to society, especially government. The CEO will report to the President and the Board of Directors and work collaboratively with them in leading the ARRL in accordance with its Articles of Association, Bylaws, and Board Policies. Specifically, s/he will ensure the day-to-day management of the League and the League's fiscal operation. In addition, s/he will oversee and make certain that the fund-raising, marketing, human resources, technology, advocacy, and governance strategies of the League are effectively implemented across all segments of the organization. Interested candidates will find additional information concerning the position and the application process on the ARRL website. For the past 45 years, residents of Atlanta, Georgia, have celebrated Independence Day by closing one of the city's busiest thoroughfares and allowing 60,000 runners to take part in the Peachtree Road Race, sponsored by the Atlanta Journal-Constitution and the Atlanta Track Club. Supporting the runners are some 5000 volunteers, including more than 50 Amateur Radio operators. Nearly 200,000 spectators enjoyed this year's event. Coordinating the Amateur Radio response were race Communications Director David Ziskind, KE4QLH, and Chris Balch, KS4MM, an ARRL Volunteer Counsel and Atlanta ARES Assistant Emergency Coordinator. Volunteer operators came from ARES groups and Amateur Radio clubs throughout the Atlanta metro area. "This year provided a particularly challenging environment as July 4 saw Atlanta hit by a long line of severe and dangerous thunderstorms just as the race got under way," Balch recounted. "As the storms intensified, Track Club officials made the decision to hold the [remaining] runners and move those waiting to start indoors for safety. After a 30 minute delay, the other 25,000 race participants emerged into the rainy late morning and completed their annual jog down Peachtree Street." Working closely with the Atlanta Fulton County Emergency Management Agency (AFCEMA), the Atlanta Police and Fire departments, and federal and state law enforcement and public safety agencies, the Amateur Radio contingent provided crucial on-course intelligence and safety reports for injured runners, race conditions, and even the occasional suspicious package. Learning from the 2013 Boston Marathon experience, net control operations for the race are located at AFCEMA's underground Emergency Operations Center. AFCEMA Director Matthew Kallmayer worked with Atlanta ARES EC Ken Reid, KG4USN, to stock the EOC with three dualband radios. This let the ham volunteers run and respond to three separate nets (as well access a D-STAR link to the Atlanta Police Headquarters), providing coordination among public safety, Atlanta Track Club organizers and media outlets. A Virginia Tech undergraduate researcher and radio amateur has used Super Dual Auroral Radar Network (SuperDARN) and Reverse Beacon Network (RBN) data to study how solar flares impact HF radio propagation over the entire dayside -- the time Earth is in sunlight -- with communication loss related to both flare intensity and distribution. 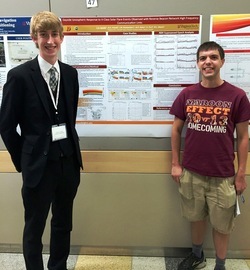 Carson Squibb, KM4MBQ, recently summarized his findings in a poster presentation, "Dayside Ionospheric Response to X-Class Solar Flare Events Observed with Reverse Beacon Network High Frequency Communication Links." As most HF operators understand, higher-intensity flare events can cause complete signal loss on HF, while weaker flares may only partly inhibit radio propagation. Carson Squibb, KM4MBQ (left), and Nathaniel Frissell, W2NAF. According to Squibb's poster, a solar flare is an event in which the Sun emits high levels of ultraviolet and X-ray radiation, resulting in increased photoionization in the ionosphere, primarily in the D-layer, which is largely responsible for absorption of HF radio waves. So, as ionization increases during flare events, communication can be diminished or lost completely. Such fadeouts can occur in minutes, while subsequent recovery can take hours, "which is why understanding these flare effects is of critical importance," Squibb said. According to Squibb, the rate of communication loss is related to the increase in X-ray intensity, and the period of recovery is influenced by both flare intensity and the rate of decline in X-ray flux after peaking. Squibb determined that lower frequencies experience fades in propagation prior to the flare peak, with recovery taking longer, while the degree of loss is more severe as frequency decreases. Squibb's poster explains that SuperDARN detects a ground-scatter band that results from waves reflecting from the ionosphere and ground, and that this band is degraded during solar flare events. To determine the spatial distribution of flare effects, Squibb used data from four radars across North America. He used the RBN -- an array of passive receivers which detects Amateur Radio signals and posts identifiable call signs on the Internet -- to measure HF communication. Squibb chose 3.5, 7, 14, 21, and 28 MHz for study. Xâray flux data within the 0.05-0.4 nm and 0.1-0.8 nm ranges were taken from the GOES-15 geostationary weather satellite. Squibb said future research should focus on quantifying the relationship between flare characteristics and HF signal fadeout. Squibb conducted his research under the guidance of graduate student Nathaniel Frissell, W2NAF, and SuperDARN group supervisors Jo Baker and Mike Ruohoniemi, as part of his participation in the Research Experiences for Undergraduates (REU) program sponsored by the National Science Foundation and hosted by the Center for Space Science and Engineering Research (Space@VT). His co-authors included Magda Moses, KM4EGE, of Virginia Tech, and Robyn Fiori of the Canadian Space Weather Forecast Center. The number of registrations in the International Lighthouse and Lightship Weekend (ILLW) reached 506, with 32 countries represented. Activity for the August 15-16 event was higher this year from the major seafaring nations of Australia, England, and Germany, adding to growth from Bulgaria, Canada, Cuba, France, Portugal and Scotland, ILLW organizers reported That was down from 2014, however, when there were 544 entrants for the operating event. Michael Sealfon, WA2OCG, put the number of 2015 registrations over the 500 mark, when he signed up to operate from Alki Point Lighthouse marking the southern entrance to Seattle's Elliott Bay in Washington. 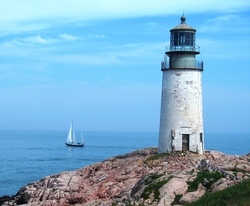 More than 70 US lighthouses and lightships were activated for the 2015 event, some identifying with 1 × 1 special event call signs. Cuba this year had 13 registered sites, possibly a reflection of the normalization of diplomatic relations with the US. The operation of Glenn Alford, VK3ILW/VK7, was typical of the DX available. On the air from Cape Wickham Lighthouse on King Island, he logged contacts in the Canary Islands, Cuba, Baltic Islands, Guatemala, Europe, the US, Alaska, Australia, and New Zealand. Australia Broadcasting Corporation informed listeners that visitors to the red-and-white candy-striped Point Moore Lighthouse, some 400 km north of Perth and dominating the Geraldton skyline in West Australia, had claimed a new world record for the most people hugging a lighthouse. The lighthouse -- built in 1878 and one of Australia's oldest steel lighthouses -- hosted the ILLW operation of Maarten Plug, VK6MP. More than 1000 turned out for the world record-attempting embrace. During ILLW, the doors of the lighthouse were opened to allow a glimpse inside. Retired physician Jerry Metz, N1QLL, camped out on Mistake Island to activate Moose Peak light, built in 1851 and still in operation on Maine's foggy Down East coast. The World Digital Amateur Television (DATV) QSO Party will celebrate its 5th year when it gets under way August 21-22. Organizer and anchor Peter Cossins, VK3BFG, has been busy planning for another successful event. While the event is centered on the VK3RTV Melbourne-Geelong DATV repeater, stations in the US, the UK, and elsewhere are welcome to join via a local ATV repeater or via Skype. A DATV "test pattern" transmitted via the VK3RTV repeater in Australia. Cossins said any station not in range of VK3ATV repeater may use the Skype name, "DATV QSO Party." He has suggested that participants prepare a couple of short videos. Prices Reduced on ARRL Operating Books and Resources: The ARRL is rolling back prices once again! Save 20 percent on select ARRL operating-themed publications and resources when you order online now through August 31, 2015. No coupon code is necessary, and discounted titles may be combined with one coupon code offer. For a complete list of discounted publications, visit ARRL's "Operating Books & Resources Price Rollback" page. ARRL publications are available from the ARRL Store or from your ARRL Publication Dealer, or call (860) 594-0355, toll-free in the US, (888) 277-5289, to order. E-mail ARRL Publication Sales for more information. FCC Releases Online Table of Frequency Allocations: The FCC released an updated online, downloadable Table of Frequency Allocations on August 15. The FCC notes that the Table "as published by the Federal Register and codified in the Code of Federal Regulations, remains the legal source material." The online Table may display amendments that have been adopted by the FCC but are not yet in effect, the FCC said. Tad Cook, K7RA, Seattle, reports: Solar activity declined over the August 13-19 reporting week. Average daily sunspot numbers went from 82.3 during the previous 7 days, to 37.4 in the most recent period. Average daily solar flux also declined over the same 2 weeks, from a mean of 112.4 to 91. Average planetary A index went from 11.7 in the previous week to 21.4 in the recent 7 days. Activity over the August 15-17 period drove these numbers higher, with planetary A index at 44, 36 and 27 during the 3-day period -- the result of a coronal mass ejection (CME). The latest predicted solar flux from NOAA/USAF over the near term is 100 on August 20; 105 for August 21-23; 110 on August 24-25; 115 on August 26; 110 on August 27; 95 for August 28-September 2; 100 on September 3-4; 105 on September 5, and 100 on September 6-7. Solar flux then declines to 85 for September 10-18 and rises to 100 after September 29. Predicted planetary A index is 18 on August 20; 10 on August 21-22; 12, 10, and 8 on August 23-25; 12 on August 26-27; 10 on August 28-29; 5 on August 30-September 1; 12, 22, 15, and 12 on September 2-5; 10 on September 6-7; 8 on September 8-9; 5 on September 10-11, and 10, 20, and 15 for September 12-14. At 0636 UTC on August 19 Australia's Space Weather Services released this geomagnetic disturbance warning: "A large Coronal Hole (CH 683) is located in the solar Northern Hemisphere and is taking geoeffective position. A high-speed solar wind stream emanating from CH 683 is driving a Co-rotating Interaction Region (CIR) and this will affect Earth's geomagnetic environment over the next 1-2 days. Minor geomagnetic storms could occur in the high-latitude regions and possibly extend into the mid latitudes. The aurora may be visible from the southern parts of Australia at the local night hours on 19 and 20 August." In Friday's bulletin we'll have an updated forecast and reports from readers. Send me your reports and observations.